Chinese Unicorn - Unicorns Rule! What Does the “Quilin” Unicorn Looks Like? Qilin is often depicted as having a single horn on its forehead, a yellow belly, multicoloured back, the hooves of a horse, the body of a deer, and the tail of an ox. It is also said to have a gentle disposition, and never walks on verdant grass or eats living vegetation. In some aspects it resembles the Western unicorn. Like the Western unicorn, Qilin symbolizes longevity and prosperity and is believed to live for at least 2000 years. The first Qilin is said to have appeared in the garden of the legendary (Yellow Emperor) Huangdi in 2697 bc. 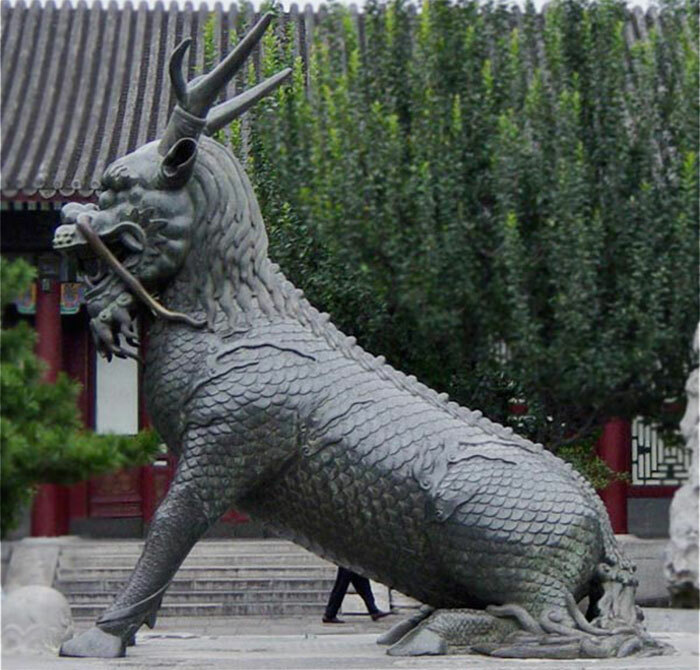 Nearly three centuries later two Qilin were reported in the capital of Emperor Yao. Both of these events are said to have bore testimony to the benevolent nature of these rulers. Other earlier references to the Qilin were in the 5th century BC Zuo Zhuan. Qilin also made appearances in a variety of further Chinese works of history and fiction, such as Feng Shen Bang. Emperor Wu of Han was said to have captured a live Qilin in 122 BC, although some were skeptical of this. In 1414 a live giraffe was brought to China for the first time and presented as a Qilin to the Ming emperor Yongle. The wise old warrior saw through the intended flattery and curtly remarked that he was certainly no sage and the animal was certainly no Qilin. The mythical animal become a stylized representation of the giraffe in the Ming Dynasty. The identification of Qilin with giraffes began after Zheng He’s journey to East Africa. The Ming Dynasty bought giraffes from the Somali merchants along with zebras, incense, and other exotic animals. Zheng He’s brought back two giraffes to Nanjing, which they were referred to as “Qilins”. The Emperor proclaimed the giraffes magical creatures whose capture signaled the greatness of his power. The identification between the qilin and the giraffe is supported by some attributes of the Qilin, including its quiet nature and vegetarian diet and its reputed ability to walk on grass without disturbing it. Other attributes which suggest a similarity are that the Qilin is described as having antlers like a deer and scales like a dragon or fish. Since the giraffe has horn-like “ossicones” on its head and a tessellated coat pattern that looks like scales, it is easy to see how one may draw an analogy between the two creatures. This analogy between the two creatures has had a lasting influence. Even today, the same word is used for the mythical animal and the giraffe in both Korean and Japanese. The mention of the Chinese Unicorn goes back to the days of Confucius. At that time it had a more peaceful appearance. When walking, it did not cause any harm even to insects. When stepping on the grass it did not crush it. It fed only on magic grasses. It could walk on water and fly. When carved on gravestones, it would protect from evil spirits, as well as accompany the dead to heaven. However, over time this peaceful appearance has changed. Though it was once a symbol of peace and gentleness, it has also acquired the features of power and strength. In Feng Shui, Qilin symbolizes long life, celebration, magnificence, joy, wisdom, and famous children. It is a gentle, kind, and benevolent creature and carries a mystical good omen. One of the most common myths of Qilin is that the advent of a great sage was made known when a Qilin appeared to the pregnant mother of Confucius (6th century bc). The Qilin then coughed up an inscribed jade tablet that foretold the future greatness of her unborn child. The death of Confucius was also foreshadowed when a Qilin was injured by a charioteer. Another myth about Qilin is said to be this. Five thousand years ago a Chinese emperor was sitting on the shore near the Yellow River, when he saw Qilin. The dirty water of the river turned green and became crystal clear . Qilin then stood before the emperor, stomped on a rock three times, and spoke in a voice similar to a temple bell. When Qilin turned to leave, the emperor saw magic signs on his back, and copied them. According to this legend, this is how the first written language appeared in China. According to another legend, Qilin is one of 9 sons of a dragon, which can distinguish between good and evil. It is also sometimes included in the list of four noble animals, along with the dragon, phoenix and tortoise.